Tensions yesterday forced Christians to cancel the procession for the feast of Christ the King. Prayers for peace. Seven people were killed in clashes and 250 were injured. A sign of divisions in the country. 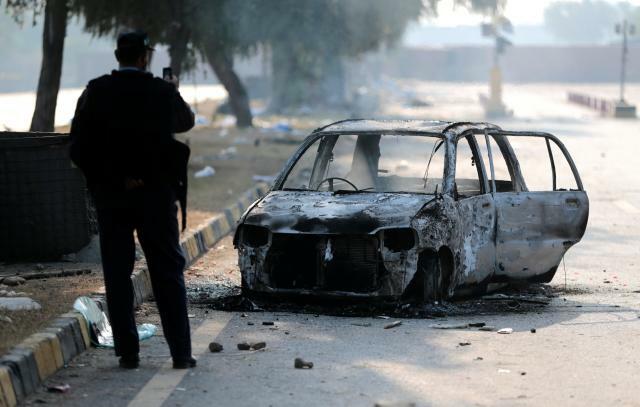 Lahore (AsiaNews) - Islamic protesters have announced the interruption of two-weeks of protests paralyzing various Pakistani cities, triggering strong clashes with police in which seven people died. This morning, the radicals got what they had been demanding: the resignation of Justice Minister Zahid Hamid, accused of blasphemy for approving a law that does not foresee the oath of allegiance to the Prophet Mohammed by parliamentarians. The tensions of recent days have impacted everyone’s lives, including Christians. For security reasons, in fact, the annual procession for the feast of Christ the King foreseen for yesterday was cancelled. "We were ready, but we had to respect the will of security personnel. Someone could have interpreted our hymns incorrectly in this atmosphere of fear and terror, "comments to catechist Rafique at the end of the Mass on November 26, celebrated at the Sacred Heart Cathedral in Lahore. The faithful gathered in the churches to pray for peace, though the participation was low because of the tensions. Islamist protesters were still blocking the main streets of several cities, despite attempts two days ago to clear the Tehreek-e-Labaik Pakistan activists. The new Islamabad-based Islamic political party is chiefly responsible for the two-week occupation. The party's spokesman announced this morning's interruption of protests. In recent days, furious groups vandalized the houses of three ministers from the ruling party, the Pakistani Islamic League (Nawaz), including that of Hamid himself. Fr. Inayat Bernard, Rector of Lahore Cathedral, says the administration should never have touched such a controversial clause. He adds: "Protesters should show tolerance and avoid hindering trade and peace in the country. We should have started the procession from the Marian shrine, but the faithful could only raise their voice to the Prince of Peace inside the cathedral. We did this for authorities and pray because that they are able to restore discipline. " Last night the news channels resumed broadcasts after a day of media interruption. Social media sites like YouTube are still blocked. The Punjab government ordered the closure of all education institutes for two days. Amir Zulfiqar, deputy general inspector of the Punjab police affirms that the provincial administration has "the most difficult task" in the current crisis. "We have mixed emotions when confronted with religious protesters. Our heart is on the part of our faith, but our duty comes first in our minds, "Zulfiqar commented to AsiaNews. "These protests are symbolic of our internal problems. As a police officer, I think we are disintegrating and this frightens me. Our society is in deep depression and the media can play an important role in securing religious harmony. "